New to The Happy Chicken Coop? 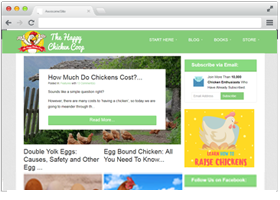 TheHappyChickenCoop.com is one of the world’s leading online publications devoted to helping backyard chicken keepers. Since we ‘hatched’ in 2015, over 1.7 million chicken enthusiasts have relied upon The Happy Chicken Coop for all things chickens… Whether you’re just starting out, or are a flock veteran, you’ve come to the right place. Here at The Happy Chicken Coop, we believe that everyone is capable of raising chickens. Even if you’ve lived in the city all your life and have never stepped foot in the countryside, it’s possible. This site’s here to show you how. We make it our job to help educate people how to raise chickens properly. You can expect a friendly welcoming approach to raising chickens. With each article focusing on fun, informative, practical and down-to-earth explanations. If you are completely new to raising chickens, I would recommend making your way through our website first. On our website we have over 100 articles that will provide a wealth of information for you. If you’re already raising chickens I would recommend reading our advanced chicken raising articles. Here we go in-depth on issues such as managing the pecking order, breaking broody hens, figuring out why egg production has stopped and much more. The Happy Chicken Coop is here both as guide and as a friend. We want to share with you our knowledge to help make you a better chicken keeper. We want to hear from you as well. Is there anything else we can do to help you? We want The Happy Chicken Coop community to grow and learn from each other. As you can imagine, we receive hundreds of emails each day. We do our best to respond to emails, however we are not able to answer each one that arrives at the Inbox. Any chicken raising questions will very likely be answered with a simple, quick search on our website.